"The goal of The Legend of Pufferfish Pat was to create a work in which families can hear characters share their tips and ideas for managing angry feelings and see characters modeling different anger management strategies. But don’t tell the kids that. The kids will just know that they are having fun!" "The most impressive aspect to the piece is the clever manner in which various themes are subtlety reenforced....Also impressive is the manner in which a secondary theme regarding gender plays out. Without preaching or knocking a brick wall onto the audience, the script also makes a point of encouraging us to embrace choices outside of traditional gender expectations. MD Theater Guide Five Stars! "Pufferfish Pat was a Top Five Show of the Week, "Pufferfish Pat” is charming and funny with versatile actors"!" "Ali Oliver-Krueger’s play is smart, simply put. It teaches a lesson without feeling preachy or pedantic, and it is easily accessible to kids of all ages, even relevant to adults! The words and descriptions that Oliver-Krueger uses to accurately express what it feels like to have an anger attack are vivid and extremely relatable. Oliver-Krueger expresses the importance of anger being a normal human emotion and the fact that it can be healthy to feel it while acknowledging the fact that there are healthy ways in which it can be expressed. She manages to do this in a fashion that is accessible to young audiences without feeling too childish and it makes the story full of heart and great learning opportunities." DC Metro Theatre Arts Five Stars! "My children loved the opportunity to sing, clap, create drum rolls, and otherwise become part of the story. InterAct does a great job of allowing children to actively participate in the theater experience, with interactive crafts set up in the lobby before and after the show and a list of discussion questions in the program for parents to use as discussion starters after the show...One Gold Coin – Una moneda de oro is a delightful show and I would highly recommend it to parents..."
"Working to serve the company’s mission of actively involving young audiences in the production in a way that is interactive, Director Ali Oliver-Krueger and her performance team of three achieve the high standard set by this statement and the result is a fantastical time for everyone in attendance. From pre-show Gold-Coin making activities to the chance to be a part of the plot by singing, gesturing, and other interactive moments, Oliver-Krueger ensures that everyone who sees the show gets the maximum InterAct Story experience from doing so." "It is an amazing opportunity for InterAct Story Theatre’s local artists to perform for their hometown community, and it’s a wonderful opportunity for local audiences to enjoy a play that has delighted thousands of children throughout the region." "In Former British Children’s Laureate Michael Rosen’s June 2014 Guardian article on arts education, he provides a checklist for teaching artists to keep in mind. 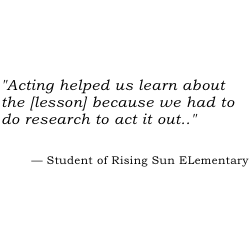 The list has ten ideas that revolve around creating a supportive environment that encourages risk-taking, imagination, and collaboration... an excellent concept for teaching artists to keep in mind, but [the article] also acts as a fairly accurate description of how InterAct Story Theatre’s production of The Hero of Everything was an immense success." "A remarkably entertaining and educational hour of quality theatre for young audiences, InterAct Story Theatre is performing heroic deeds with this production of The Hero of Everything. A fantastic opportunity to show that learning can be fun while exposing children to the marvels of theatre, this show is hands down worth seeing this fall season." "The Hero of EVERYTHING is a fresh, fun, and interactive way for kids and families to explore the importance of teamwork and the perils of trying to do everything yourself, all by being part of the action of a superhero play for heroes of all ages." "In addition to being a thought-provoking, family-friendly, and thoroughly painless teaching aid, Not My Monkey is an uproariously funny, colorful, and acrobatic romp. In short, Not My Monkey is more fun than a barrel of . . . !" "The show is brilliant for many reasons, including the lesson it teaches, but mostly because of the multifaceted theatrical experience provided with so many different types of performance craft incorporated for the audience to see." DC Theatre Scene 5 out of 5 rating! "I wish I could time travel and send my 4-year-old self to see the Shirt of Happiness, produced by Interact Story Theatre, and frankly, anything and everything else the Interact Theatre has its sights on.... The piece is children’s theatre at its very best: transportive, engaging, and full of heart." "The wide array of characters will tickle not only the kids in the audience, but the adults as well (with characters like Ethel Mermaid, what’s not to love?)." "InterAct Story Theatre is a welcome edition to Capital Fringe and the family-friendly troupe are clearly proficient at engaging both the kindergarten contingent and their caretakers." DC Metro Theater Arts Five Stars and "Best of the Fringe"! "While ostensibly aimed at grades pre-K to 6, the multi-generational crowd at the performance I attended was thoroughly delighted; even grandmas and grandpas responded with their inner child." "Take the kids, or maybe soak up some new-age wisdom yourself, in this InterAct Story Theater production that follows Prince Parsley's harrowing quest to find his joie de vivre. The show promises to answer questions like "What is the secret to being happy," and at ticket prices that are less expensive that a visit to the therapist, I'd say going to this play is a real bargain. Audience participation and a child-like sense of wonder is recommended, but not required." Brett Abelman/Babelwright: A Biased Guide to Capital Fringe 2013 July 8, 2013. "If children’s theatre can be Fringey, this might be the show that works in both worlds, and InterAct is the kind of top-notch company that could pull it off." 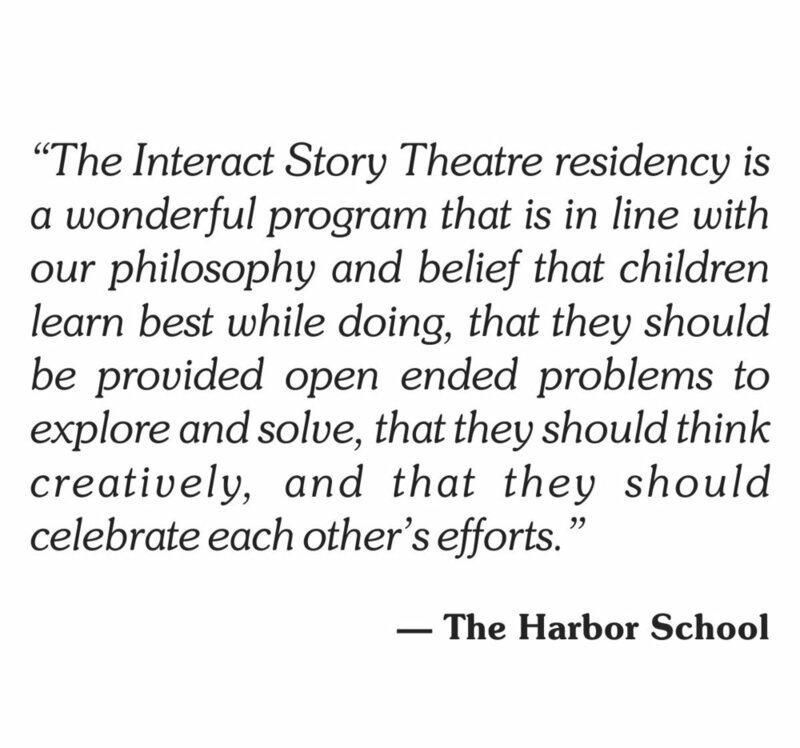 For videos of InterAct Story Theatre artists in action and videos of student work created with InterAct Story Theatre artists, please check out InterAct Story Theatre's YouTube Channel or Vimeo Channel to check out our latest videos. Thanks! Clip video from InterAct Story Theatre's October 2014 "Not My Monkey" by Ali Oliver-Krueger, performed October 2014 at the Arts Barn in Gaithersburg. Featuring: Anna Jackson, Jack Novak, Alani Kravitz, Sarah King, and Ali Oliver-Krueger. Technical Direction by Peter Oliver-Krueger. Music by Tom Teasley. Costumes by Ali Oliver-Krueger and Denise Young. Jack Novak and Alina Collins-Maldonado in "The Shirt of Happiness" at the Capital Fringe Festival.